This isn’t a great time of year for getting fresh eggs. 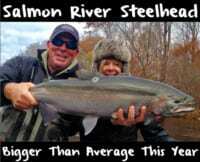 Those of us chasing summer steelhead in the Northwest are likely using eggs from the fall or winter. In fact, all of my eggs were cured months ago in either BorX O Fire or Fire Cure. Finding fresh eggs is rare and will be for the next month or so. Fortunately, many of us have eggs we froze from fall Chinook and winter steelhead season and while I thaw those eggs and use them during the summer I’ve tweaked the way I fish them. Rather than using them straight off the thawing process I’ve been enhancing them to make them more attractive to our summer steelhead. 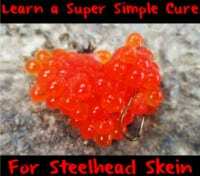 The process couldn’t be simpler, but is imperative for pitching eggs to weary summer steelhead. It’s important to have a quality egg for these fish. Many of these fish have been in the river system for a period of time. At this point of the season they’ve seen a lot of bait already. It’s vital to having quality bait. This is why I’m enhancing my eggs. During summer steelhead season I like to run a firm egg. I’ll leave them out at night on a rack to firm them up. In fact, some days I’ll reapply Natural, Pink or Red BorX O Fire depending on what’s going on with the color of the water in the river I’m fishing. If it’s gin clear I’ll sprinkle on Natural BorX O Fire. Meanwhile, when there’s more color I’ll enhance them with the Red or Pink BorX O Fire. Our clarity can change weekly depending on water conditions. Remove eggs from the freezer and thaw them out overnight or however long it takes. Take a bottle of Red or Pink Fire Brine and a half-cup to a cup of salt and a half-cup to a cup of sugar and add it into a jug or container. Pour the above made solution into a Ziploc bag that contains the thawed, pre-cured eggs. Let eggs soak in solution for 6 to 8 hours at room temperature. Remove eggs and place them on a drying rack or paper towels if you don’t have one (do not use newspaper as the ink will transfer onto the eggs). Then, allow eggs to air-dry for five hours to overnight depending on the temperature outside. You want these eggs to be firm rather than juicy. Cut eggs to desired size for fishing. Place them in a container and add your BorX O Fire to help dry and firm them up more. Then put them into the fridge overnight and they’ll be ready to fish in the morning. Editor’s Note: Todd Daniels is a veteran salmon and steelhead guide based in Western Washington. He operates Tall Tails Guide Service. For more info please visit http://talltailsguideservice.com.